All things being equal. was presented at Ottawa Art Gallery, August 21 -September 13, 2015. In her MFA thesis exhibition All things being equal. 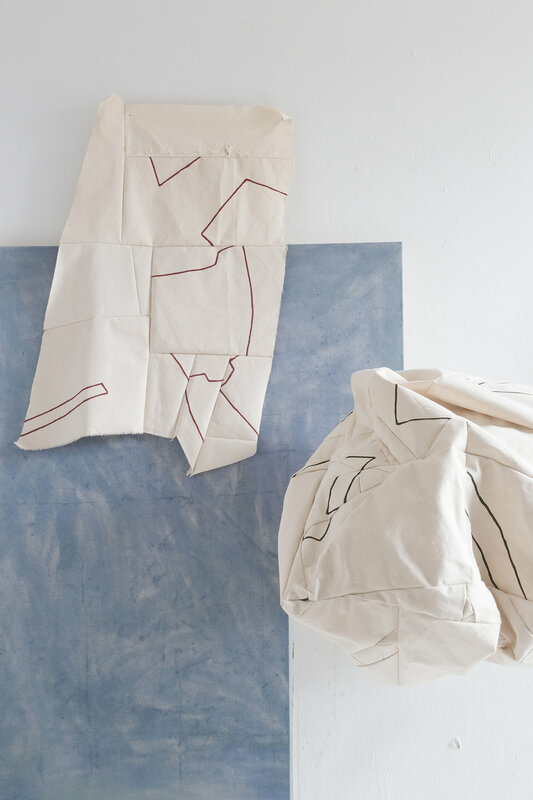 conceived specifically for the Firestone Gallery, Jessica Bell presents the very idea of constructing a painting as a way of making sense of the world. Simple materials and formal devices make allusions to ordinary events and experiences. The works bear the marks of incidental studio occurrences which conjure a conversation between the will of objects and the artist’s intention to activate them. Canvas and stretchers appear like characters, assuming the posture of active participants instead of subservient structure. The pieces engage with and resonate in one another, emphasizing the temporal relationship with the physical space. The forms are deliberately abstract and minimal, drawing our attention to subtle differences in the surfaces of material, gentle play with volume and light, and the quiet passage of time. All things being equal. was exhibited with support from Ola Wlusek, Ottawa Art Gallery and the University of Ottawa’s Department of Visual Arts Master of Fine Arts graduate program. RBC Canadian Painting Competition Catalogue. 2015: 16-17. Print.